A joke inside ad agencies is yes, we can make concepts “go viral,” but we charge extra for that. Last night Seth Casteel’s photos of underwater dogs started popping up everywhere in Facebook and Twitter streams, without agency help. Seth has been around for a while — his website has a quote from Cesar Millan, and Seth had a guest segment on the TV show Extra! back in November 2009. So why now? 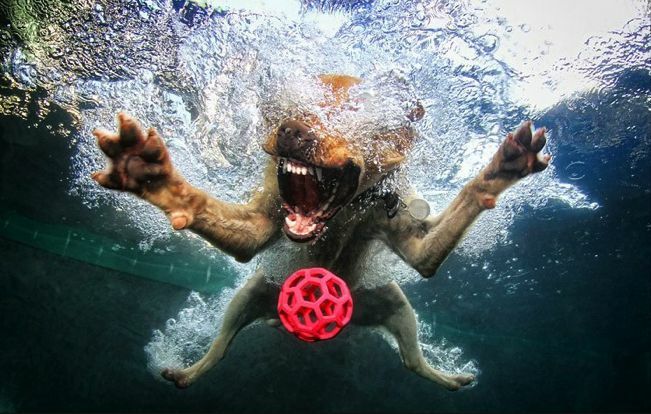 Why, for a fleeting moment, are people crazy about sharing pics of dogs baring fangs underwater? Back in 2010, I defined the mathematical formula for viral success. The truth is no one can plan or predict how an idea will fit into the cultural context of the moment, or how the pattern of complex passalongs leads to the viral success where the share rate exceeds the stall rate of transmission. For people to get excited enough to share an idea, it has to resonate against a cultural moment, provide a frisson of entertainment or shock, and stand out from competing ideas. This is one reason why marketers spend north of $3 million for Super Bowl ads, because the consumer ecosystem is primed to act on exciting ideas and share them (but only if the ideas are exciting, unlike most ads in this year’s Super Bowl). Yesterday was a cold February Friday in the Northern Hemisphere in the dead zone weeks after the Christmas holidays and weeks before spring. People are bored, and perhaps funny images of dogs in summery water gives us hope that blasé winter will end. So we share. No one knows why. You can’t predict it. Some things just make a splash.